Developing economies face numerous challenges regarding reliable electricity supply and waste management. SustainPower responds to these needs with our unique containerised sustainable power generating solutions. With dedication to quality, passion for efficiency, and an urge to fulfil our responsibility to people and the planet, we strive to make a difference in the way developing economies generate power. SustainPower will become the leading African manufacturer of containerised solutions for sustainable power generation from biogas, landfill gas, natural gas and other sustainable and alternative energy sources such as solar and wind. SustainPower offers containerised, high-quality, durable solutions for sustainable power generation, designed and manufactured in South Africa, with world-class components. At SustainPower we care about the planet and its people. Climate change, the need to manage diminishing fossil fuel reserves and the lack of access to reliable electricity are some of the biggest challenges currently facing mankind. Renewable energies are sources of clean, inexhaustible and increasingly competitive energy. They differ from fossil fuels principally in their diversity, abundance and potential for use anywhere on the planet, but most importantly they do not produce greenhouse gases or polluting emissions. To secure our future and that of generations to follow, it is widely accepted that we must act now to reduce energy consumption and substantially cut greenhouse gases, such as carbon dioxide. In addition to the above, there is a direct link between economic growth and electricity supply in Sub-Saharan Africa. Countries with electrification rates of less than 80% of the population suffer from reduced GDP per capita. From an electricity-access point of view, sub-Saharan Africa’s situation is the most pressing. Approximately 600 million people in sub-Saharan Africa do not have regular access to electricity. Access to electricity is crucial for human-wellbeing and economic development. It is essential for the provision of clean water, sanitation and healthcare, reliable and efficient lighting, heating, cooking, mechanical power, transport and telecommunications services. To encourage economic growth and development, as well as drastically improve the quality of life in Sub-Saharan Africa, it is crucial that communities have reliable access to power. Through our containerised sustainable energy solutions, SustainPower responds to the needs of developing economies, whilst at the same time limiting damage to the environment and preserving our planet for future generations. SustainPower offers containerised, high-quality, durable solutions for sustainable power generation, designed and manufactured in South Africa, with world-class components. We implement South African design, engineering, assembly, fabrication, and commissioning, trusted by world-class suppliers offering technical support and product warranty. The purchasing of locally manufactured products promotes the injection of money back into the country and the economy, thus contributing to job creation, poverty reduction and skills development. SustainPower is passionate about promoting and developing the South African economy through the sale of quality South African sustainable energy solutions. A wealth of experience and exceptional passion. Managing Director Tobias came to South Africa in 2012 as the CFO of one of the largest manufacturing companies in the country. 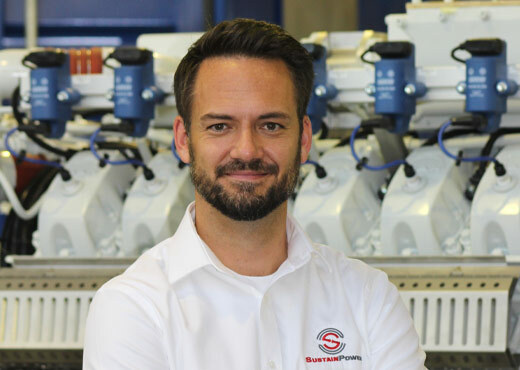 His leadership skills and passion for manufacturing led to his role as CEO in a medium-sized, South African, engine building firm, before founding SustainPower in 2016. Tobias accumulated a wealth of experience in Financial Management and Business Strategy during the 10 years he spent working in Japan and Germany for one of leading German car and truck manufacturers. His passion for Africa, combined with his enthusiasm for entrepreneurship and his love of the planet are the driving forces behind the establishment of SustainPower. Tobias holds a Master of Science degree in International Business from University of Gavle and Diplom Betriebswirt from Hochschule Mainz. Head of Operations Prior to joining SustainPower, Ames was Regional Business Development Manager of Sub-Saharan Africa at one of the world’s largest oil and gas service companies. He has extensive experience in managing projects, involving the maintenance and delivery of large equipment packages, throughout the developing world. Ames began his career in the Rocky Mountain and Alaskan oilfields. With over 12-years’ experience in Oil and Gas operations he has held various positions in field operations, maintenance, service, and sales management. 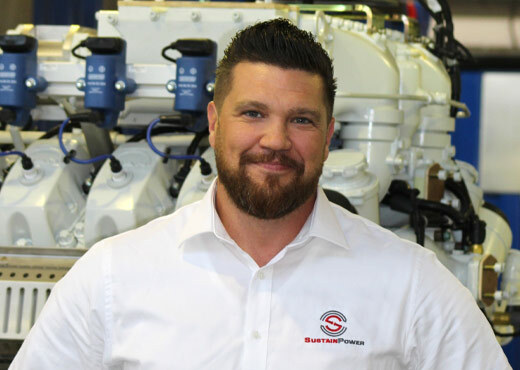 With qualifications in Diesel and Industrial Technology and Project Management, and his experience in business development, operations, service and sales, Ames is a significant contributor to SustainPower’s strategy.